Product #3340 | SKU OCTAMICII | 0.0 (no ratings yet) Thanks for your rating! 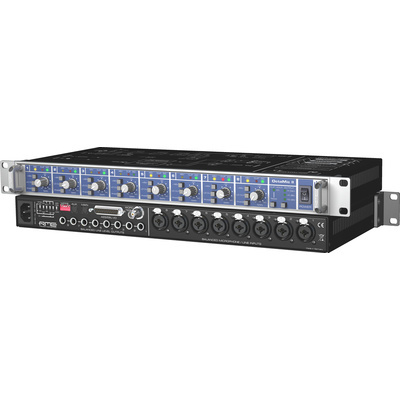 The OctaMic II from RME is an 8 channel microphone/line preamplifier that also provides pristine analog-to-digital conversion of all channels. Low distortion, excellent signal-to-noise ration and highly linear frequency response all contribute to the ability of the unit to transmit and amplify an accurate representation of the source. The analog-to-digital converter delivers 8 channels of pristine digital output, available as double ADAT output (S/MUX up to 96kHz) and simultaneously as 4 AES outputs (up to 192kHz) via a DB-25 connector. The converter can be clocked internally as a master, or externally via word clock and AES sync, while SteadyClock technology ensures the very best sound quality even with a jittery external clock.